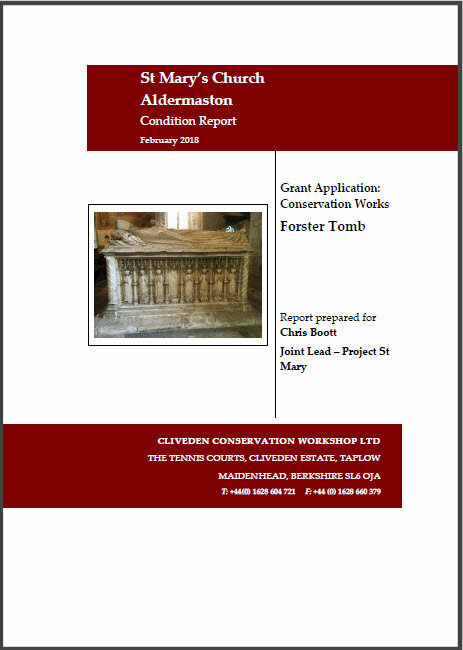 Conservation reports on the Forster Tomb and the Plaster Plaque have been received from Cliveden Conservation. The reports detail the history, condition and repair and maintenance needs of each of the monuments. They are formatted to comply with the Church Building Council’s Guidelines for conservation grant applications to meet the requirements for conservation funders in the future. On Project St. Mary’s they will form part of the documentation and estimatations for the renovation of the church. Little is known about the physical history of the monument. Anecdotally it is said that the arch above partially collapsed onto the monument, damaging the lower part of the effigy of Sir George Forster. The repairs undertaken to remedy the damage to his legs, as well as some remaining damage to the east end moulding is still visible, however, no documentation was found (including a trip to the Cathedral and Church Buildings Division’s library) to supply any more information on this matter, such as the date this event happened. The monument commemorates Sir George Forster and his wife Elizabeth de la Mare. George Forster of Harpsden (near Henley) was born in 1469. In 1492 he inherited the Aldermaston estate from his wife Elizabeth’s childless brother, Thomas de la Mare, upon his death. In 1501 George was knighted by Henry VII and became Sheriff of Berkshire and Oxford in 1517. In 1525 Sir George was made a Knight of the Bath. Sir George had great wealth and influence at court and was part of Henry VIII’s entourage at the Field of the Cloth of Gold in 1520. 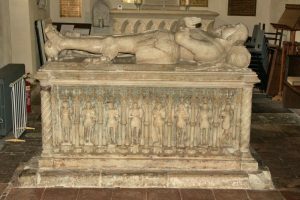 Elizabeth died in 1526 and Sir George in 1533 and the monument is known to have been erected in the lifetime of Sir George. Considering Sir George Forster’s wealth and apparent influence it is no surprise that he commissioned a monument from such a talented craftsman to commemorate both himself and his wife. Although it is not known who undertook the commission, there is no disputing the quality of workmanship displayed in the carving and detail, which is quite exquisite. It has been mentioned that the sculptor or mason was one Richard Parker, one of the alabaster men active at the time, but there are no records to support this theory. There is in fact only one documented tomb by Richard Parker from Burton upon Trent. That is the tomb-chest of Thomas Manners, 1st Earl of Rutland and his second wife Eleanor Paston, located in St Marys Church, Bottesford. More likely, as the composition and execution are so remarkably similar, is that the Forster monument was undertaken by the same hand as the creator of the Roos monument in the Rutland Chantry Chapel, St George’s Chapel Windsor. It certainly is very similar in style, but unfortunately the sculptor of this monument is also unknown. Incidentally, Lady Roos died in 1526, the same year as Lady Elizabeth Forster. 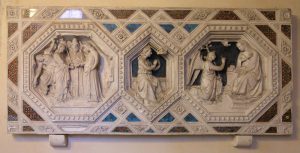 The panel is a plaster-cast from the original marble relief which is on the tabernacle in the church of Or San Michele, Florence. The original was carved in marble 1352-1360 in Florence by the sculptor Andrea di Cione (1343-1368) (also known as Orcagna). The series of reliefs depicting scenes from the life of the virgin are set around the base of Orcangna’s tabernacle. The Victoria and Albert Museum have sections of the panel that were cast in Plaster in 1864 by Stiattesi Signor. Although it is not known who cast the panel in St Mary’s Aldermaston, or how this panel came to be in the Forster Chapel, plaster casts of this type were being produced and sold in Italy towards the end of the 19th century. In December 2017, the Project team held two days of interviews for the position of Conservation Architect on Project St Mary’s. 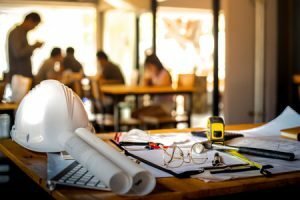 A Conservation Architect acts as the lead professional on a project advising the project team on design, restoration and renovation. They bring in the appropriate specialists as required and they overseeing work by sub-contractors and specialists. 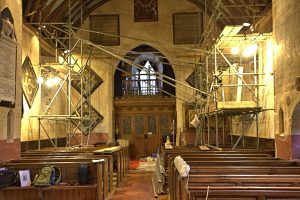 In addition to being the Conservation Architect the successful candidate will be appointed as Quinquennial Architects for the churches of St. Mary the Virgin, Aldermaston and St. Nicholas, Wasing. The team from Acanthus Clews of Banbury were selected from a shortlist of four excellent candidate firms. It was felt that Acanthus Clews bring the right level of experience and knowledge that will enable Project St. Mary’s to be successful. More information on Acanthus Clews can be found on their website. The first task for Acanthus Clews will be the quinquennial inspections of the two churches in early 2018. Treatment to stabilise the plaster on which there are special Medieval and Reformation wall-paintings was undertaken in July 2017. 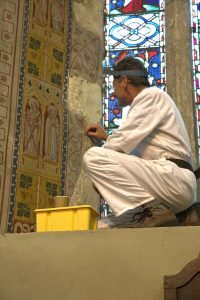 As part of the Church of England ‘100 Treasures‘ initiative, the conservationist Peter Martindale returned to St. Mary’s. He secured the plaster work behind some of the wall-paintings. This follows up on the recommendations Peter made in his 2016 report on the condition of the wall-paintings. Treatment was to an area at the west end of the north wall of the church, up to the second window, where there are Medieval and Reformation wall-paintings. These wall-paintings had been identified in Peter’s report as being in danger of further deterioration and possible loss if remedial action wasn’t taken. Scaffolding was required for Peter to safely access and carry out the treatment to the higher parts of the walls. It was also required to brace the specialist pressure pads Peter used to hold the wall during drying of the lime-based grouting. The special grouting is injected behind weak or flaking areas of plaster. In the picture, that looks west towards the main entrance to the church, can be seen the scaffolding structure used. The left side is just there to prevent any movement of the working platforms on the right, hence the bracing poles across the aisle. Peter concluded the week’s work by following up on his initial study of the wall-paintings by completing the survey of rest of the church. This was because of the volume and extent of the wall-paintings in the church Peter had run out of time in his Dec 2016 assignment. We are expecting Peter’s second concluding report on the wall-paintings later this summer. 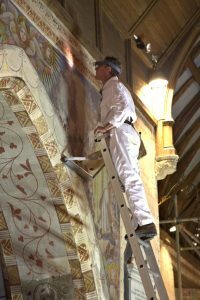 This will give us a complete record of the condition of wall-paintings in the church and an accompanying action list for the major restoration work, that will eventually include the cleaning of all wall-paintings. 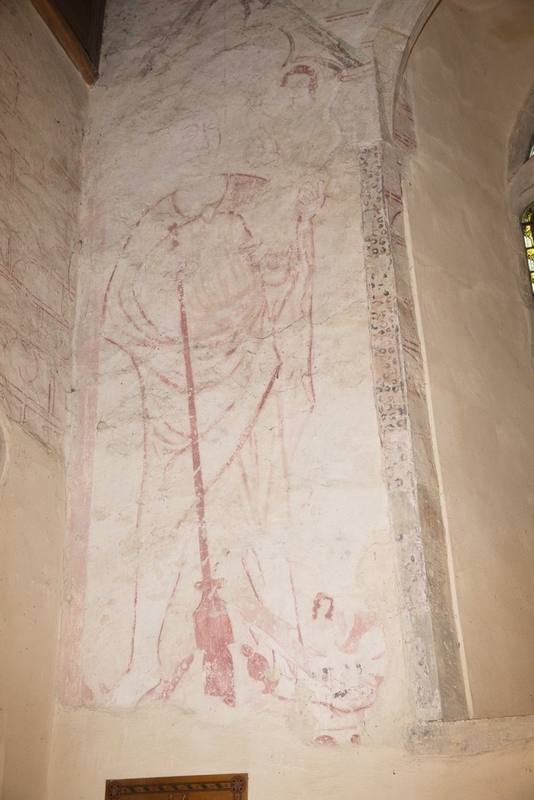 Several of Aldermaston Church’s medieval wall paintings will be conserved thanks to a grant from the Headley trust. to conserve the wall paintings in two historic churches. St Ambrose. We can now commission surveys to inform the next stages.